There’s no other parts, manuals, software included. Other Notes of Interest. LOCATION: I-L-2-3. SuperMicro SNK-P0038P Heatsink X8 for 2U Xeon LGA1366 Socket. There’s no other parts, manuals, software included. Other Notes of Interest. LOCATION: I-L-2-3. SNK-P0038P LGA1366. INCLUDES: 1x Unit. We recognize and respect your privacy concerns and expectations about how we use this information. We want you to know about our privacy policies and practices, and what we do to protect your Personal Data. Up for sale is a USED LGA1366 Heatsink and Fan Dynatron G555 for X58 and Xeon. Does NOT come with bottom plastic piece with female threads for under the mother board, it has apparently gone missing. 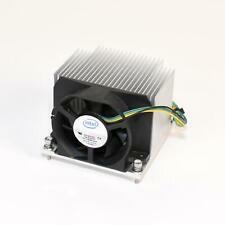 **NEW** Intel Heatsink and Fan for i7-990X i7-980X i7-980 i7-970 Socket LGA1366. E97381-001 Condition is New. 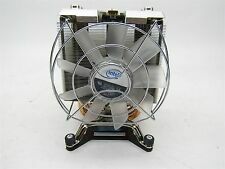 *NEW* Intel Core i7 950 960 LGA-1366 Socket CPU HEATSINK Cooling Fan E97380. Condition is New. What you see is what you get. These heatsinks have been removed from working servers and inspected for any physical defects. Supermicro SNK-P0041. Product Specifications. It is new in original box. See pictures for details. Physical Condition:NEW. Working Condition:NEW, working properly. We can then adjust your invoice before checkout. Requesting an Updated Invoice. Dynatron G121 Socket 1366 Passive 1U CPU Cooler. CPU Socket: 1366. Solution: 1U. Material: Aluminum Heatsink. HP ProLiant BL460c G6 Blade Server. HP ProLiant 460 Series Generation 6 Blade Server. HP P/N: 586631-001 / 508766-001. HP S/P#: 508955-001. The heat sink has been fully tested and validated by Supermicro to ensure the best quality and cooling performance. Supermicro 4U Active CPU Heat Sink Socket LGA1366/1356 (SNK-P0040AP4). 4U Active CPU Heat Sink. Supermicro SNK-P0038P 2U Heatsink for LGA1366 Xeon Processors. They are of high quality, with copper base and heat pipes. They are good for any Xeon 5500 and 5600 series processors. These heatsinks were pulled from working Supermicro servers with X8DT3-LN4F motherboard. Make sure this is the correct part before purchasing. Compatible with LGA1366 socket processors, including If in doubt, consult the manual for your motherboard and CPU and the datasheet for this product. Hours of Operation. N/A 90 90 64 X8, X9 2U DP Servers. PROCESSOR IS NOT INCLUDED . X8 2U UP Servers. Covered by Full Supermicro Manufacturer Warranty! Screw, Spring, and Mounting Bracket (BKT-0023L Included). Hours of Operation. LGA 1366/1356/1155/1156. Socket Type LGA 1366/1356/1155/1156. Material Aluminum fin with Copper Core. Fin Process Extrusion. Fan Specification We take pride in our highly qualified crew with vast knowledge and experience with computers & electronics. Manufacturer : HOJET. Thermal Interface Material: Shin Etsu X-23-7783D. The 06DMRF is essential for the success of your Server as it dissipates heat allowing your internal hardware components to remain as cool as possible. 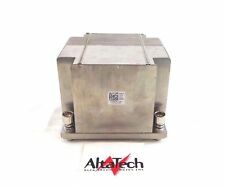 Part Number06DMRF. Socket CompatibilityLGA 1366/Socket B.
Genuine Dell PowerEdge C1100 CPU Cooling Heatsink CX2WM 0CX2WM CN-0CX2WM. Part Number: CX2WM. MPN: CN-0CX2WM, 0CX2WM. Socket: LGA1366, Socket B. From a server. Works well! 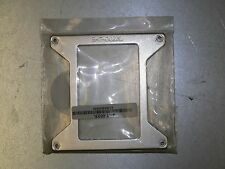 Socket LGA1366. This works on theLGA 1366 / Socket B motherboard. This is for the CPU cooler ONLY! No CPU is included. Trending at $51.47eBay determines this price through a machine learned model of the product's sale prices within the last 90 days. THE SCAN DOESNT HAPPEN TILL NEXT MORNING AT THE SORTING FACILITY. IF YOU ARE NOT SURE, RESEARCH IT PRIOR TO BUYING. I WILL TRY TO WORK IT OUT WITH YOU.